Heart Check up camp at Delhi Bar Association, Room No 18, Delhi High Court. The camp was inaugurated by Chief Justice of Delhi High Court. Total no. of registration 250. Dr Ripen Gupta, Dr Abid & Dr Munir participated in the camp. Services offered: Ht, Wt. BP, Blood Sugar (R), BMI, General Check up, Cardiology consultation, Diet Counselling, ECG & ECHO. FHVK marketing material were distributed to the bar association members.& our ambulance was also stationed at the venue. 29th Nov 2007 : - 9th National Congress on Pediatric Critical Care was held at FHVK training room in Vth Floor from 9:00 am to 5:00 pm. This session was attended by 35 delegates followed by procedures. 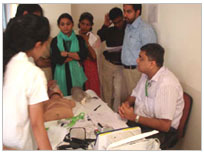 Workshops at different workstations were held in MICU & Multi - Speciality OPD Area. Dr. Peter Cox & Dr. Bala Ramachandran were distinguished Faculty speakers of this event. A CME was conducted in Rohtak with API. Dr. Amit K Mandal (Consultant - Pulmono- logy) delivered a lecture on "Role of Lung Biopsy". Dr. Pinak Shrikhande (Consultant - Critical Care) talked on "Management in Hypertension Crisis". Dr. Sanjeev Gulati (Sr. Consultant - Nephrology) talked on "Recent Advances in Management of Renal Hypertension"
FFLRDH organized a Free School Health Check Up in CCA (Col. Central Academy School), Sec 4, Gurgaon. We examined total of 480 Students (1st to 5th standard). A General check up (Height & Weight) was done along with few consultations. The whole effort was supported by Pediatric, Dental, psychology, Nursing and marketing departments. 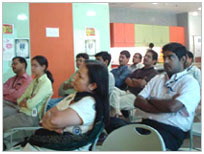 We organized a Health Talk in Cairn Energy, Gurgaon by Ms Rupali Datta (Chief Clinical Nutritionist). The topic was "Food as a tool for Wellness". Fortis Healthcare vasantKunj and Apollo Hospital Delhi together, organized a workshop in BLS / ACLS for 3 days. There were approx 40 members in this workshop. It was conducted in Training Room .102, Fortis Healthcare, Vasantkunj. The major participants were from Fortis Healthcare mohali, Fortis Healthcare noida, Fortis-Escorts Jaipur, Fortis Healthcare vasantKunj and Apollo Hospital. Organised a Health Camp in Deepalay School, Gole Kuaa. Opp F- 33, Ohkla Phase I from 9:30am to 2:30 pm. 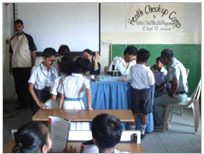 A General Check Up was done for students which include Height; Weight & BP Check up & Consultation by Pediatric Consultant & Screening was done by Dental Department. Consultants which participated in the camp were Dr Kulraj Kapoor, Dr Sangeeta Subhudhi, Dr Nipun Kashyap from Pediatric Department Dr Priyanka & Dr Sangeeta participated from Dental Department .Ms Binu , Mr. Alex & Mr. Roshan participated in the camp from Nursing Department & Ms Jasmin & Mr. Rehman from Marketing Department. Organizing a Guest Lecture on Organ Donation Awareness - Australian Perspective by Milind Sanab, Consultant, Critical Care, Lyell MC Weni Hospital, Adelaide. It was organized at FHVK in 5th Floor, Training Room. 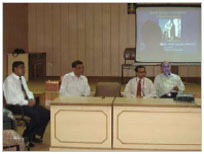 Session was chaired by Dr R.K Mani, Director Pulmonogy & Dr S. Bal, Associate Director, Pulmonogy & Thoracic Surgery. 42 doctors attended this Scientific Session. 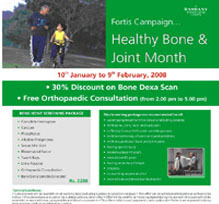 To address the growing problem of Bones and Joint related ailments with in the community, Fortis Hospital at Vasant Kunj has taken an initiative in recognizing the month of Jan 2008 as "Healthy Bone & Joint Month" from 10th Jan to 9th Feb 08. This endeavour is aimed at generating awareness with regard to early detection, prevention & treatment of Bones & Joints related Diseases, including Osteoporosis within the community. 30% discount on Bone Dexa Scan. Free Orthopaedic Consultation from 2 pm to 5 pm. Specially created Bone/Joint Screening Packages available @ Rs. 2200- ( Attachment ).